Need A New Lock Installation In NYC? Choose Froglock! Your security is important to me and I truly believe installing locks of high quality is the key to your security. Froglock’s trained locksmiths provide new lock installation services for your commercial or home security. We are experienced in all different lock types whether you need a deadbolt lock, high security lock or even a mortise lock installed. Froglock installs only quality locks and we will personally make sure everything is working correctly and you know how to operate your new lock before we leave. We will be happy to talk to you about your security needs and help you choose the correct new lock for your situation. The process of installing a new lockset on a door is simple. Start by screwing a template on the portion of the door earmarked. The next thing must do is to cut a mortise on the edge of the door for the lockset. Ensure that you make holes in the frame for the strike plate which is usually used to engage the lock’s bolt. For this job to be successful, you need the following set of tools; a tape, a lockset, a pencil, a combination square, sandpaper, a chisel and a screw driver. You also need the new set of the lockset to be installed. Use the power drill to drill holes on the door using a template as your guideline. 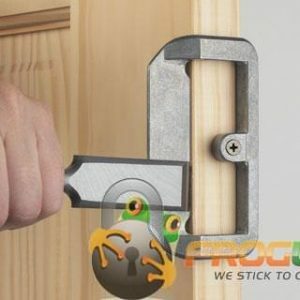 Drill two holes; one of the holes to be used for the lock cylinder should be drilled on the door while the bolt hole must be drilled on the edge of the door. When drilling the hole for the lock cylinder, you need to be extremely careful not to damage the veneer. Once you notice that the point of the drill is coming through, stop drilling and finish the drilling from the other side. You should then drill a hole in to the edge of the door till it reaches the cylinder hole. This drilling is complicated and must be done at a right angle and sandpaper used to make the surface smooth. After finishing the drilling, insert the bolt in to the hole with the bolt plate placed over it and trace the outline. Use a chisel to cut out the mortises after which insert a bolt and its plate in the mortise. Finally, you should screw the bolt in place and insert the outside lock. To schedule a new lock installation contact Froglock qualified locksmiths in New York servicing Manhattan, Brooklyn, Queens, the Bronx, and Nassau County of Long Island.